I totally had to listen to this asap. Anyway, so yes. This was a really great continuation of the series. We pick back up with both sides of the story, on Earth and in Space. Donovan and his team are going through some awful conditions and worse situations to get to the resistance that is left. There were some moments here where I cried, it’s so extremely well written that we get to know and love the character in book 1 and yet M.R Forbes delves even deeper with them and makes us feel even more! This book totally pulled my heart out. Gabrielle and the old Gator… just superb characterisation. Though they go through so much as father and son, as a team on the Magellan they pull out no stops to protect and survive. 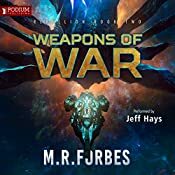 This was a totally nail-biting audiobook, the fights the action, the love and people lost along the way. A total must listen. Awesome narrator and author, I want the next one. Like now!